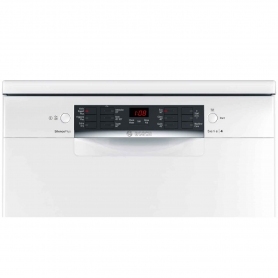 This sleek, white dishwasher has 14 place settings, creating a huge amount of space for the whole familyâs dishes and utensils. Receiving an âAâ in both washing and drying ratings, this model provides superior cleaning to keep your dishes sparkling. Thanks to the VarioSpeed option, you can also reduce cycle times by up to 50% without compromising cleaning performance â perfect for when you have unexpected guests. 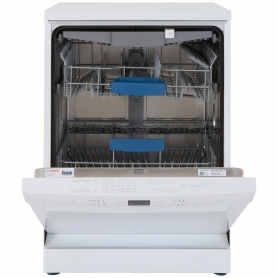 VarioFlex baskets let you adjust the dishwasherâs layout to make room for larger or awkward shaped items. 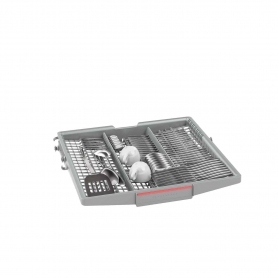 Roasting trays, serving dishes and chopping boards can all fit into the bottom basket easily if you alter the top layerâs height. Or, why not make use of the four foldable plate racks in the bottom basket? If you lead a busy lifestyle, you can also take advantage of the time delay option. Postpone your wash from 1-24 hours, so you can come back to freshly clean dishes at the end of the day. Thereâs also an indicator to show how much time there is until the end of the wash. 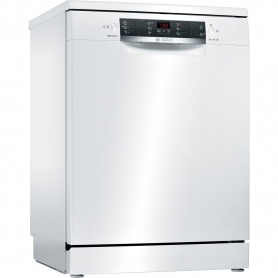 The Bosch SMS46MW02G is a super quiet dishwasher with lots of useful, time-saving features. Itâs exclusive to Euronics and Agent stores, so you wonât find this fantastic model anywhere else. Order now.